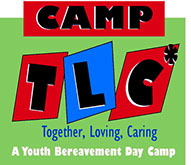 To help support children who have lost a loved one, our annual Camp TLC (Together, Loving, Caring) provides a safe environment for sharing of feelings. Anyone who has lost a loved one understands what it feels like to be overwhelmed with a variety of feelings, such as loss, grief and anxiety. For children, the range of emotions can be even more extended and intense, and parents may not know how to help their children grieve and cope effectively. To help children and parents, Hospice Care of the Lowcountry offers Camp TLC, a one-day Youth Bereavement Day Camp. It provides a unique environment and experience for children to explore and express their grief and pain. Campers range in age from 6-15 and are divided into age-appropriate groups for some activities. This unique camp touches lives through crafts, recreation, professional therapists, nurses, social workers, clergy and trained volunteers. Activities are designed to help children express feelings related to their loss and to decrease their sense of isolation by providing opportunities for them to interact with other children who have experienced loss. Please advise us of and dietary restrictions, or physical limitations, so that we may accommodate special needs. All identifying registration data and information shared at camp is kept strictly confidential. We have planned a full day of activities, some serious, some creative and some just for fun. Campers will have a chance to play and laugh and meet new friends. Expression of feelings is sometimes made easier through creating artwork, drawing a picture, making a collage, or writing a poem. Children will be encouraged to use available materials to showcase memories, or to illustrate some of the emotions that they need to express. Some campers might want to talk about their feelings concerning the death of a loved one. Others may prefer to listen to their peers or to counselors. No matter which route they choose, it is just that – their choice. No one will pressure anyone into sharing. One of the most meaningful activities of Camp TLC is the Remembrance Ceremony at the end of the day. Led by our chaplain, this ceremony gives participants an opportunity to express thoughts and memories of their loved ones in a special way. Parents are encouraged to attend this closing session.